Three broods, mid-May to late September. Old fields, pastures, forest clearings, powerline cuts, roadsides, and other open areas. This is a small to medium-sized butterfly with a wingspan of ⅞″ to 1⅛″. 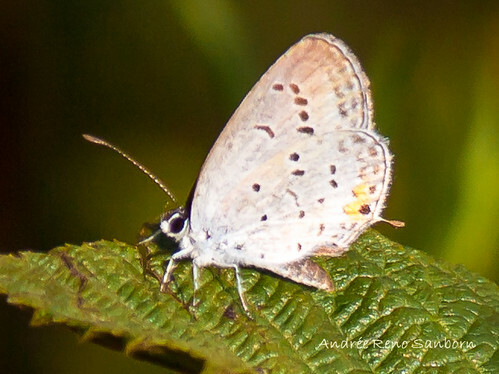 On the male, the upperside of both wings is medium blue with a broad black marginal band and a white fringe. The hindwing has a hair-like tail and a row of submarginal black spots on the trailing edge. One or two of the spots near the tail are capped with orange. One or both of the tails are sometimes missing, having been lost to a predator. 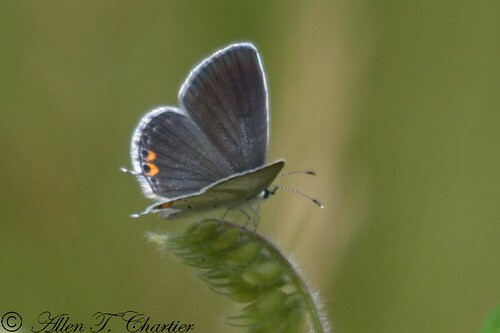 The female wings are similar but dark gray usually with no blue near the base. The underside of both wings is light gray with a thin black margin on the trailing edge; a marginal row of black eye spots; a post-median row of black dots rimmed with white; and a well-defined, short, black, horizontal, medial stripe. The forewing has additional medial, white-rimmed black spots; and orange caps on usually 2, sometimes 3, of the marginal eye spots near the tail. There is no blue eyespot near the outer angle. The antennae are black-and-white striped with a white-tipped club. The caterpillar is wide, somewhat flattened, and short, no more than ⅜″ long. The head is small. It is retracted into the thorax except when feeding. The thorax and abdomen are moderately covered with conspicuous, usually white, sometimes black, star-shaped hairs.. The thorax and abdomen are variable in color; sometimes green, sometimes brown tinged with yellow, pink, green, rose, or purple. There is usually a dark brown stripe on the upper (dorsal) surface extending from the thorax to abdominal segment 10. There is also a prominent dark stripe, sometimes edged in pink, in the subspiracular area extending from the thorax to abdominal segment 10. The are dare, ill-defined, oblique lines above the spiracles on thoracic segment 3 and abdominal segments 1 through 6. Mature caterpillars are found from June onward. Western tailed-blue (Cupido amyntula amyntula) male has only one orange-capped black spot on the underside of the hindwing near the tail. 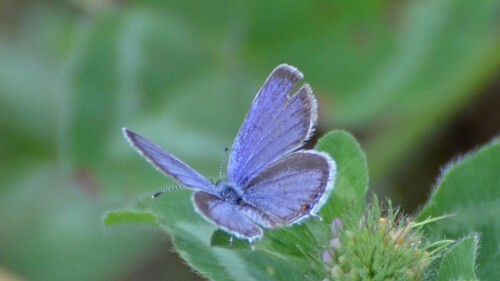 The female has some blue at the base of the wings. Buds, flowers, seeds, and sometimes leaves of bush clover (Lespedeza spp. ), clover (Trifolium spp. ), lupine (Lupinus spp. ), pea (Lathyrus spp. ), sweet clover (Meliotis spp. ), tick-trefoil (Desmodium spp. ), vetch (Vicia spp. ), and other herbaceous legumes. Adults have a short tube-like tongue (proboscis) and must nectar on flowers that are open or have short tubes, such as white sweet clover (Melilotus albus), white clover (Trifolium repens), beggarticks (Bidens spp. ), spreading dogbane (Apocynum androsaemifolium), cinquefoil (Potentilla spp. ), strawberry (Fragaria spp.). The females lay eggs singly on flowers and young leaves, or in spring on immature flowering buds. Larvae molt four times before pupating. Late season individuals overwinter as mature larvae, often in seedpods, and pupate in the spring. Adults often rest with wings open at a 45° angle..
Distribution Sources: 7, 20, 21, 24, 29, 71. The life stage of some insects undergoing transformation. In caterpillars, the chrysalis. Photographed at Grand Forks, North Dakota (26 May 2012). The first one is female. The 2nd one is male with blue upperside. Kissena Corridor Park, New York City, 8/12/2012 (Sun) afternoon.